What an excellent turn out on a cold February evening, it was well worth it to see the architectural hidden gems that are part of our northern heritage. Kevin Illingworth entertained us from his vast store of images and knowledge starting with features of Rufford Old Hall where a curved canopy gave protection to the ‘high ups’ from smoke and soot dropping down on them whilst they were dining. There is also one at Chethams School of Music in Manchester. 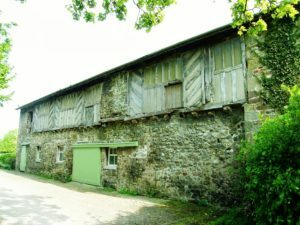 His talk ranged from some of the oldest timber framed buildings in Lancashire and ended with architectural changes of buildings in Yorkshire where mullions and door headings were becoming more linear in style rather than rounded as in ovolo mouldings. 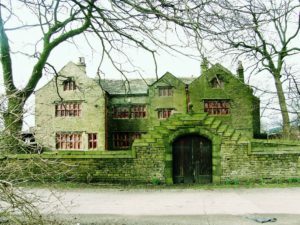 Kevin showed a Cruck barn on the Hoghton Tower estate, the majestic sinewy beams are truly splendid. They are similar to those in the Cruck Barn at our Pendle Heritage Centre (PHC) which is currently used as a venue for weddings and for which there are many events in this 40th Anniversary Year of PHC. Money raised is to go towards providing a kitchen, toilets and lighting to make the Cruck barn an even more attractive venue. 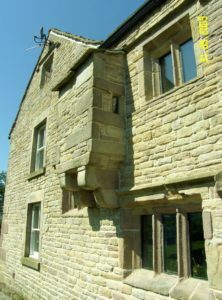 That if a house had Dairy or Dairey as in Spencers Cottage, Hurstwood or Cheese on the window lintel they were exempt from window tax for that particular room? That Spencers or Spensers Cottage has some beautiful plaster frieze work in the form of angels, oakleaves and a lion? That Roughlee Old Hall has a very distinctive and rare chimney stack? That fireplaces can sometimes have juggled joints? As in the White Bear in Barrowford and The Folly at Settle. That the White Bear was apparently gentrified by a yeoman farmer and amongst other things has a baffled entry and gables for show only. That Bashall Hall, has a half timber framed building that was known as the Barracks and was the retainers quarters which contain a beautiful ogee doorway and a jettied gallery? And you probably do know that Edmund Spenser famous for his epic allegorical poem The Faerie Queen in 1590 is said to have lived or visited Spenser’s Cottage. What with quatre foils, ovolo mullion mouldings with fillets, bressamer beams, king post beams, fire hoods and fire windows it would be amazing if anyone went away from Kevin’s talk without learning something new. Certainly much of this information will be useful to the Archaeology and Local History group when carrying out studies of old buildings. Finally, Ralph Waldo Emerson had something evocative to say about houses and people.